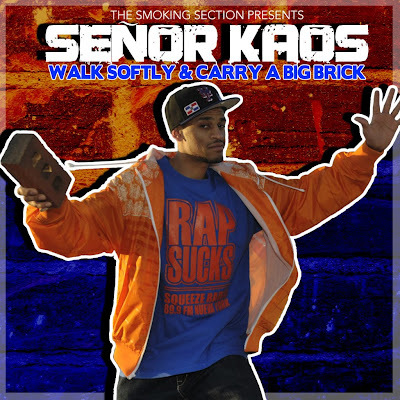 BlackRadioIsBack.com Music: Señor Kaos - Walk Softly & Carry A Big Brick Mixtape | BlackRadioIsBack.com - Official Blog of the Syndicated FuseBox Radio Broadcast! 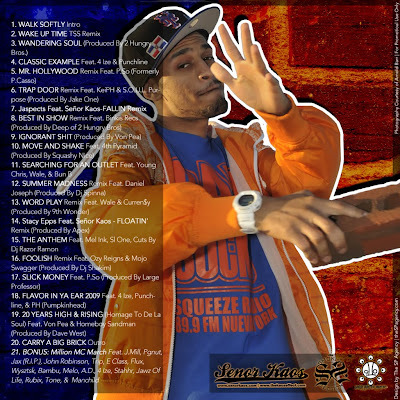 We've covered & blasted off some of the music and videos from talented independent Altanta MC, Producer & Businessman Señor Kaos in the past here on BlackRadioIsBack.com and the syndicated FuseBox Radio Broadcast. Right now, have a new mixtape project he did in conjunction with The Smoking Section crew called Walk Softly & Carry A Big Brick (heh at the title and the cover design). This latest project with Señor Kaos features guest appearances by a lot of independent & mainstream Hip-Hop MCs and producers, including Bun B, Wale, 4-Ize, Punchline, Jaspects, Stacy Epps, 4th Pyramid, John Robinson, Stahhr, Homeboy Sandman, Large Professor, DJ Spinna, 9th Wonder, Von Pea, Jake One, 2 Hungry Bros. and and many more. Señor Kaos - Automatic Classic OFFICIAL VIDEO from Señor Kaos on Vimeo. Señor Kaos Performing At Sputnik 1 of 4 from Señor Kaos on Vimeo.